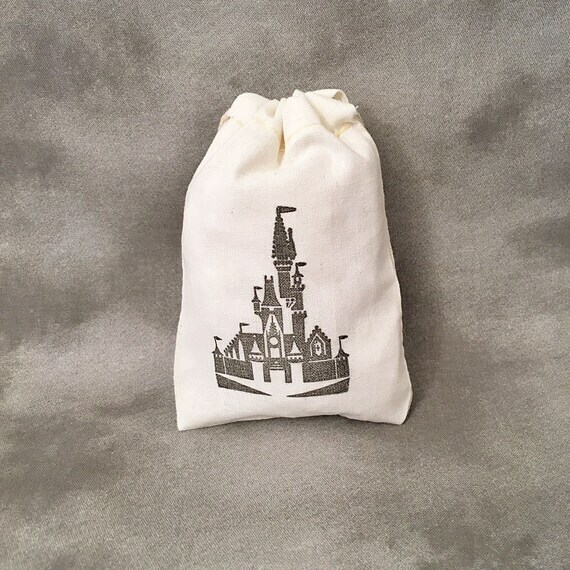 •	These personalized organic cotton muslin bags with double drawstrings are perfect as Disney wedding favors. •	Use for fish extenders to exchange with children, friends, family, cruise members, a spouse or any special person on your Disney Cruise ship – Disney Magic, Disney Wonder, Disney Dream, or Disney Fantasy. Also great to celebrate trips to Disneyland or Disney World! •	Hang the Disney Fish Extenders from a colorful string on a wall or mickey mouse on a cruise ship door for a festive garland with a fantasy décor. •	Fill with cruise gifts such as keepsakes, candy, toys, souvenirs, trinkets, Disney characters, confetti, gift cards, cash…. The choice is yours. Color of Ink - black as pictured – other ink colors are available. Need more? Ask about volume discounts for 100+ quantities. or even the addition of your logo if applicable. Convo me with your request for a quote and custom listing. Cotton muslin bags are an off white natural color with off white stitching. All bags are hand stamped with the identical design but will not be exactly the same. Stamping on fabric will produce a less dense image than a solid print, which creates a unique appeal. The majority of my work is for product packaging or custom parties and weddings. I can easily create a customized stamp using your artwork or logo. I also have hundreds of themed stamps on inventory. Thanks for stopping by! Have a cre@tive day!